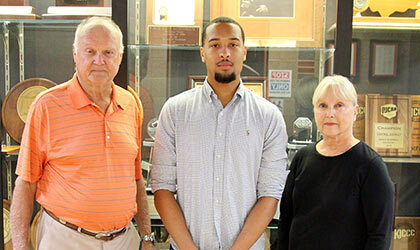 In honor of former Cowley College golfer Brian Groves, Cowley College sophomore Kyrece Mills was named this year's Brian Groves Memorial Scholarship recipient during the 22nd annual Tiger Skins/Brian Groves Memorial Golf Tournament held Saturday, June 25 at GreatLife Golf Course in Arkansas City. Tiger Booster Club president James Schaefer announced Mills as the recipient of the award. Mills is a member of the Tiger basketball team and is majoring in communications. He has a grade point average of 3.90. The second oldest of 10 children, Mills has accomplished a lot just to make it to Cowley from his home in Raleigh, North Carolina. Brian Groves (Class of 1998) was a member of the Tiger golf team before moving on to Southwestern College in Winfield. He was tragically killed in a one-vehicle accident in 2002. With 15 teams taking part in the Tiger Skins/Brian Groves Memorial Golf Tournament, the event continues to serve as a successful fundraiser for Tiger Booster Club scholarships. Along with the 60 golfers, several area businesses helped sponsor the event. Community National Bank served as the Tournament sponsor. Although there were several worthy candidates for the Brian Groves Memorial Scholarship, in the end the school could not go wrong with selecting Kyrece Mills. As for the golf tournament, the team of Brian Sanderholm, Aaron Sanderholm, Mike Sanderholm, and Don Shanks finished in first place in Flight A. The second place team in Flight A consisted of Otis Morrow, Steve Ross, Bob Yoachim, and Albert Kimsie. The first place team in Flight B was made up of Dr. Dennis C. Rittle, Daniel Rittle, Gage Musson, and Eddie Andreo. While the team of Kyle Head, Michael Dabbs, Ryan McMillan, and Ace Walker placed second in Flight B. Members of the Cowley College Spirit Squad and Tigerette Danceline assisted with the tournament. A drawing for door prizes and a silent auction was held during the awards ceremony following the golf tournament. “The Brian Groves Golf Tournament is always a great opportunity for our Boosters, Alumni and Cowley Staff to enjoy each other’s company and show their support for Tiger Athletics,” Larson said. Cowley College athletic director Shane Larson thanked Community National Bank for serving as the Corporate Sponsor for the second year in a row, while Rubbermaid was a major sponsor for door prizes and Creekstone Farms donated the hamburgers for the meal. “We had several other businesses that sponsored holes for the tournament. Without the support of these local businesses we wouldn’t be able to put on this event,” Larson said. Closest to the Line (Man) – Jose Salinas, Sr. Tournament sponsors were, Ark City Glass, Arkansas City Chamber of Commerce, Ark Valley Distributing, Community National Bank, Cowley College Bookstore, Dillons, Elite Advertising, Galaxie Business Equipment, Great Western Dining, Groves Oil Company, Herrman Realty, James and Diann Schaefer, Jennie Larson Photography, Kline Motors, Midwest Electric, Nathan Niles Family Dentistry, Paton Wholesale and Vending, Pizza Hut, Quality Water, RCB Bank, Rindt-Erdman Funeral Home, Rubbermaid Home Products, Sirloin Stockade, Super Wash, The Stock Exchange Bank, United Agency.